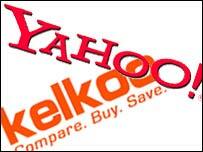 Internet search giant Yahoo is paying 475m euros ($575m; £320m) in cash for price comparison service Kelkoo. The purchase, Yahoo said, should allow it to expand its advertising and online marketing activities. Kelkoo serves nine European states, making money both off fees paid by sellers when users click through to their sites and off its own services. Kelkoo will become a subsidiary of Yahoo, and the workforce of 250 people is expected to remain intact.